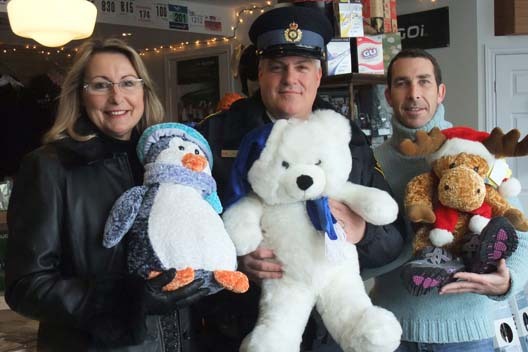 Boxes and boxes of toys and teddy bears are headed to the homes of the needy across Haldimand and Norfolk counties thanks to the second annual Reindeer Run. The fundraiser saw 125 people run or walk five kilometres of the Lynn Valley Trail in the pouring rain near Port Dover on Sunday. 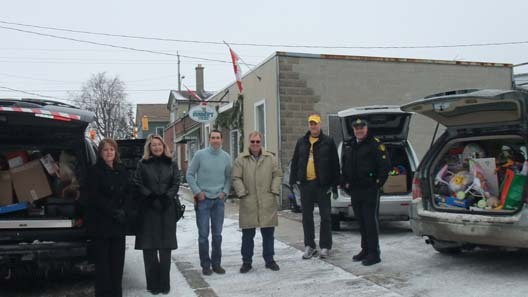 When they registered, participants donated toys, which have gone to the Children’s Aid Society of Haldimand- Norfolk. The donations will be distributed among the 700 families and more than 1,500 children the society deals with. Some toys will go under a Christmas tree in the CAS lobby. In some cases, parents on office visits “will take something home and wrap it up for Christmas,” Watson said. Port Dover resident George Mowbray canvassed his Silver Lake Estates neighbourhood on the east end of Port Dover and came away with seven boxes of donations. “It was a really good response,” said Mowbray, a retiree from Hamilton who moved to Port Dover three years ago and is a member of the North Shore Runners, the group that organized the run jointly with the Norfolk OPP. Chief organizer Scot Brockbank, who owns the Runners Den store in Port Dover, said he’d like to see the event expand. “I’d like to get 5,000 out. I have big dreams,” said Brockbank.